Liverpool's Berry Nieuwenhuys scrapbook - A one of a kind - LFChistory - Stats galore for Liverpool FC! Here we get a rare insight into Berry Nieuwenhuys' football career. The scrapbook and the photographs were owned by Berry and his wife. The scans of the scrapbook and the photographs were given to LFChistory by Gavin Foster. Berry Nieuwenhuys was a modest man who didn’t talk much about himself. As a child I spent a couple of holidays with him and my aunt, Marjorie Richards, who he married in 1964, at the Ohenimuri Country Club near Vereeniging, where he was the club professional. Although I knew he’d once been a pro footballer I had no idea of just how good he’d been or how far his talent had taken him. 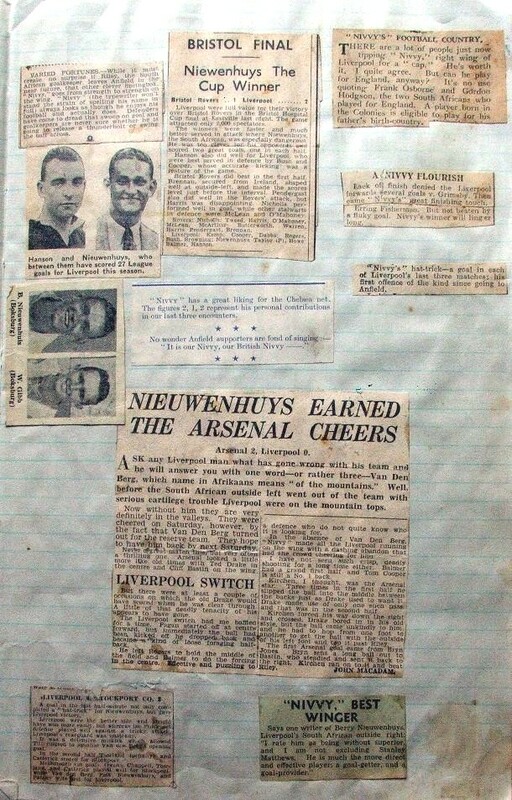 Then, in late 2003, while on holiday in Port Elizabeth, I asked my aunt if I could browse through his scrap book – a tatty A4 volume filled with yellowed newspaper cuttings, crudely titled “Scrap Book – Berry Nieuwenhuys – Liverpool Football Club – 1933 to 1946-7” in thick black letters. That, and subsequent trawling through the Liverpool Football Club’s website brought home to me how close I’d been to an icon, without knowing it. During the war years Nivvy served as a PT instructor with the Royal Air Force, but still managed to play soccer. Footballers usually represented the clubs nearest the camps where they were based, and Nivvy played for West Ham United, Arsenal and Aston Villa. He also captained the RAF. The South African footballer Nieuwenhuys has been granted a sum of £658 by the Liverpool Association Football Club for five years distinguished service. Eric Thompson of the Daily Mail joins the Liverpool sports crowd in hoping that "Nivvy" will qualify for many more happy benefit days. Berry Nieuwenhuys, as an outside right, usually colours a game with his long stride, quickness of the mark, flashing smile, and lightning shot... Has been doing that since September 1933, when he took his place among Merseyside's happy South Africans. Sketch is reproduced from an Eric Thompson drawing in his "Daily Mail" Monday Morning Sports Review. "I rate him as being without superior, and I am not excluding Stanley Matthews. He is much more the direct and effective player; a goal-getter and a goal-provider." A football writer on Berry Nieuwenhuys. Varied fortunes - While it must create no surprise if Riley, the South-African goalkeeper, leaves Anfield in the near future, that other clever Springbok, "Nivvy" goes from strength to strength on the wing. "Nivvy" (the typewriter won't stand the strain of spelling his name in full), always looks as though he enjoys his football and actually does. Defenders have come to dread that swoop on goal and goalkeepers are never sure whether he is going to release a thunderbolt or swing the ball across. Ask any Liverpool man what has gone wrong with his team and he will answer you with one word - or rather three - Van Den Berg, which name in Afrikaans means "of the mountains." Well, before the South African outside left went out of the team with serious cartilage trouble Liverpool were on the mountain tops. Now without him they are very definetely in the valleys. They were cheered on Saturday, however, by the fact that Van Den Berg turned out for the reserve team. They hope to have him back by next Saturday. Never a great match this, but very often a thrilling one. Arsenal looked a little more like old times with Ted Drake in the centre and Cliff Bastin on the wing. But there were at least a couple of occasions on which the old Drake would have scored when he was clear through. A little of that deadly tenacity of his appears to be gone. The Liverpool switch had me baffled for a time. Fagan started off at centre forward, but immediately the ball had been kicked off he dropped back and became a kind of loose foraging half-back. He left Rogers to hold the middle of the field and Balmer to do the forcing in the centre. Effective and puzzling to a defence who do not quite know who it is looking out for. In the absence of Van Den Berg, "Nivvy" made all the running on the wing with a dashing abandon that had the crowd cheering for him. I have not seen such crisp shooting for a long time either. Balmer had a grand first half and Tom Cooper is still a No. 1 back. Kirchen, I thought, was the Arsenal star. Three times in the first half he slipped the ball into the middle between the backs just as Drake used to want it. Drake made use of only one such pass and that was in the second half. Kirchen forced his way down the right and crossed. Drake bored in in his old style, but the ball came unkindly to him, and he had to hop from one foot to another to get the ball with the outside of his left foot and tap it past Riley. "Nivvy" has a great liking for the Chelsea net. The figures 2, 1 and 2 represent his personal contributions in our three last encounters. No wonder Liverpool supporters are singing: "It's Our Nivvy, our British Nivvy." 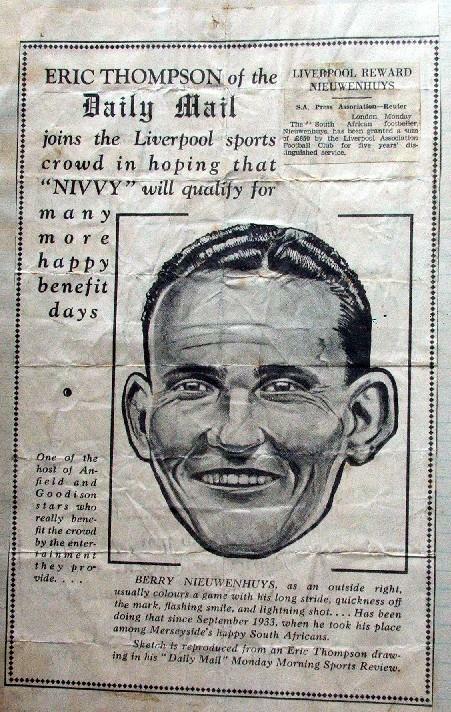 There is also a report on Liverpool - Stockport on 11th of May 1940 when Nivvy scored a hat-trick in the Western Division. His third goal came "in the last half-minute." NIEUWENHUYS THE CUP WINNER is the headline for a report on Liverpool's away game vs. Bristol Rovers at Eastville Stadium in the Bristol Hospitals Lord Mayors Cup Final on 4th of May 1937. Nivvy is referred to in the following part of the report: "The winners were faster and much better served in attack where Nieuwenhuys, the South African, was especially dangerous. He was too clever for his opponents and scored two great goals, one in each half." A NIVVY FLOURISH refers to Nivvy's winner in the 87th minute against Grimsby in the 1st division on 18th of September 1937. It was clearly a memorable goal for Nivvy for him to have kept this. The report says: "Nivvy's winner will linger long." "NIVVY'S" FOTTBALL COUNTRY - There are a lot of people just now tipping "Nivvy" right wing of Liverpool for a "cap". He's worth it. I quite agree. But can he play for England, anyway? It's no use quoting Frank Osborne and Gordon Hodgson, the two South Africans who played for England. A player born in the Colonies is eligible to play for his father's birth-country." 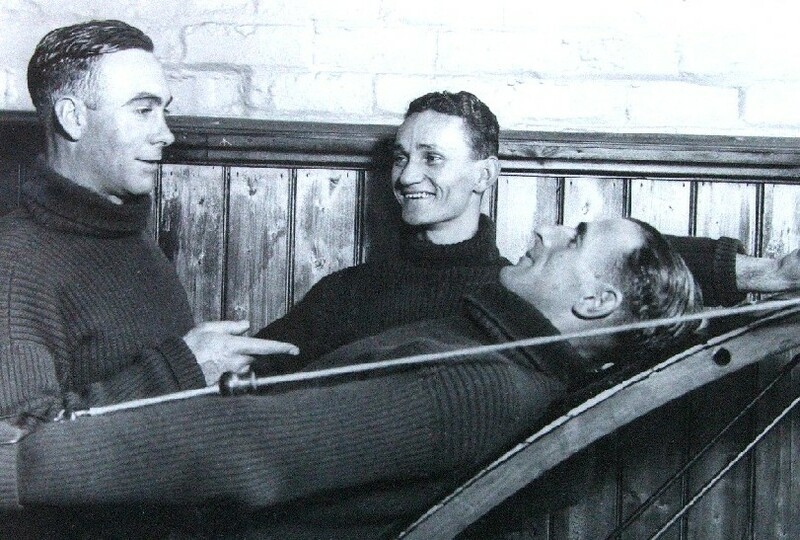 Nivvy with fellow Liverpool players and South Africans: (on the left) Gordon Hodgson who is the 3rd highest goalscorer in Liverpool's history with 241 goals in 377 games and Arthur Riley who played 338 games for Liverpool in goal. Nivvy playing with Liverpool in the 1946 USA tour. Liverpool won all 10 games with 70 goals scored and just 10 against. Liverpool line-up for the 1939-40 season which was cut short by the outbreak of World War II. Nivvy is furthest left in the front row sitting next to Willie Fagan and next to Fagan is none other than captain (Sir) Matt Busby who later became Manchester United's manager. These images are from Berry Nieuwenhuys' private scrapbook and we ask you please not to use them for your website or any other publication.